When looking for a used vehicle, you may be overwhelmed by the different options available for you. 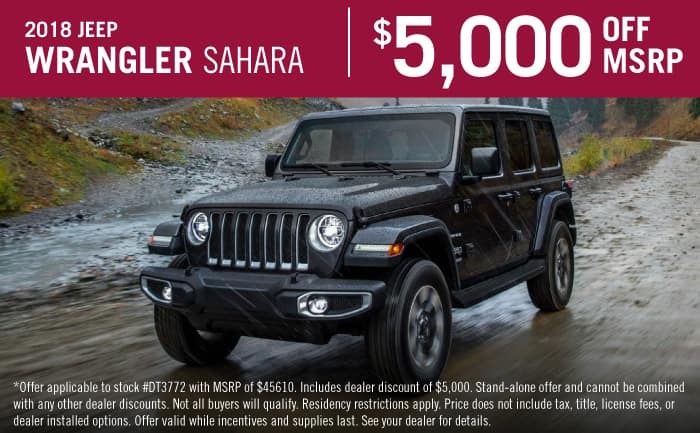 However, if you’re looking for a vehicle that can withstand the test of time, work seamlessly from on the road to off of it, and is incredibly stylish–then a used Jeep Wrangler is most definitely the SUV for you. No matter which model of the Wrangler you check out, we know that you’ll appreciate the legendary history behind the vehicle, along with the dedication by Jeep to create a modern vehicle that doesn’t skimp on why you might look at a Jeep in the first place. There truly is no downside to this iconic SUV, and if you have any inclination at all to have a bit of fun while driving, then nothing screams fun more than a Used Jeep Wrangler. For more information about a used Wrangler, keep reading! What safety features might I find in the used Wrangler? There are many different standard features you may find in a used Wrangler. Some of these features include front airbags, traction control, stability control, and antilock brakes. For more airbags, you may find the optional front side airbags. These features are perfect for keeping you safe, whether on the road or heading off on adventures through the wilderness. What are some of the trim levels that are found with a Used Wrangler? Some Jeep Wranglers come in multiple configurations and body styles. You may find a Wrangler with either two-doors (which seats four passengers) or four-doors (which comfortably seats five passengers). There are three core trim levels offered with most used Wranglers. These trim levels include the Sport, Sahara, and Rubicon. Features that you’ll find in a Wrangler Sport may include manual mirrors and locks, fog lamps, skid plates, cloth upholstery, a full-size spare tire, tow hooks, cruise control, a tilt-only steering wheel, an eight-speaker sound system, full metal doors with crank windows, a height-adjustable driver seat, and tow hooks. The Wrangler Sahara, which fits itself perfectly in the middle of the options list, includes air-conditioning, automatic headlamps, 18-inch alloy wheels, a leather-wrapped steering wheel, additional painted exterior body panels and trim, satellite radio, and hood insulation for reduced noise. The highest trim that you’ll come across is the Wrangler Rubicon. The Rubicon comes with electronic front and rear locking differentials, under-hood insulation, an upgraded transfer case with a lower crawl ratio, automatic headlamps, rock rails, an electronically disconnecting front sway bar, a leather-wrapped steering wheel, and a leather-wrapped shift knob. What engine comes in the Wrangler? The engine that runs the used Wrangler is a 3.6-liter V6. This engine produces 260 pound-feet of torque and 285 horsepower. Four-wheel drive is the standard drivetrain, and it comes with both low-range and high-range gearing. There are two different transmissions that can be found in a used Wrangler. The first is a 6-speed manual transmission that comes with hill-start assist. The second is a 5-speed automatic transmission that comes with not just hill-start assist, but hill-descent control. The towing capacity of the Wrangler can reach up to 3,500 pounds with the four-door configurations. If you’re looking for the perfect used vehicle, then a used Wrangler is for you! This vehicle combines fun with practicality and wraps it all up in a legendary and iconic package that has long been a favorite among car enthusiasts. For more information be sure to give us a call!